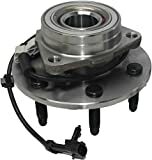 Detroit Axle: Front Wheel Hub Bearing Assembly 515036 - 6 Lug with ABS 4WD Only (UPC 848460003588) is sold at the following online stores. We've find the latest prices so you can compare prices and save money when making your purchases online. Please click on the links below to browse to each store's webpage.